The second day of the Tunis Grand Prix 2018 in Tunisia has just been completed while four weight categories were in action: women -63kg and 70kg and men -73kg and -81kg. It should be underlined that after nine weight categories (5 yesterday and 4 today), the titles are distributed among nine nations: Kosovo, Slovenia, Kazakstan, France, Russia, Uzbekistan, Ukraine, Brazil and the Netherlands. You will find below the complete results of the day and the summary of each weight category. Stay tuned for more information and comments. With no surprise, the Rio Olympic Champion Tina TRSTENJAK (SLO) entered the first final of the day where she was opposed to NOUCHI Aimi (JPN), who won the Tyumen Grand Slam in 2016. But beside that major result, the Japanese is still relatively unknown on the international circuit, while TRSTENJAK is one of the most famous competitors of the moment. The difference in status didn't seem to bother NOUCHI, who was the first to attack and her straight standing position seemed tovtrouble the former world champion. After four minutes, both athletes had received only one shido each, given at the very end of the regular time. 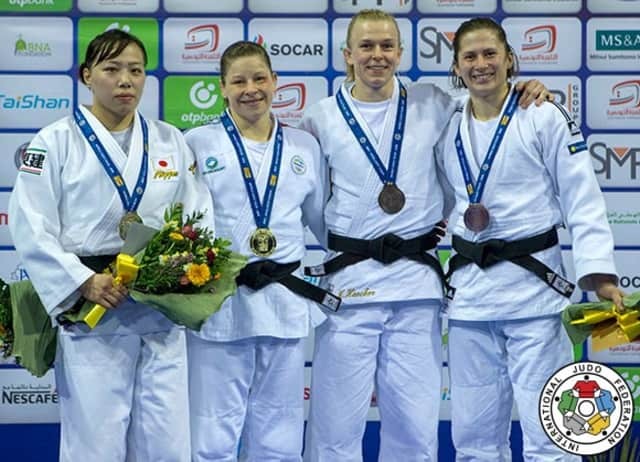 After 20 seconds of golden score, the Slovenian launched a powerful attack for no score and it was finally after 49 seconds that she could engage a left handed drop-seoi-nage for waza-ari and a sixth gold medal atva Grand Prix. The very first bronze medal contest of the day opposed the 2015 Cadets World Champion, and 2017 Junior World silver medallist, Sanne VERMEER (NED) and the 2016 Oceania Champion Katharina HAECKER (AUS). After 47 seconds VERMEER was penalised with a first shido for passivity. But then it was HAECKER's turn to be penalized. With a superb koshi-guruma for waza-ari, HAECKER took the lead of the bout and just had to control until the last seconds. Despite a second shido she won her third medal on a Grand Prix. Magdalena KRSSAKOVA (AUT), winner of the Tbilisi Grand Prix in 2017 and Lucy RENSHALL (GBR), holder of three world circuit medals so far, faced off in the second bronze medal contest. After 49 seconds RENSHALL received a first shido for passivity. With 14 seconds left, KRSSAKOVA finally found a tiny opportunity to counterattack RENSHALL for a waza-ari on the edge of the competition area adding a fourth medal on a Grand Prix to her prize list. 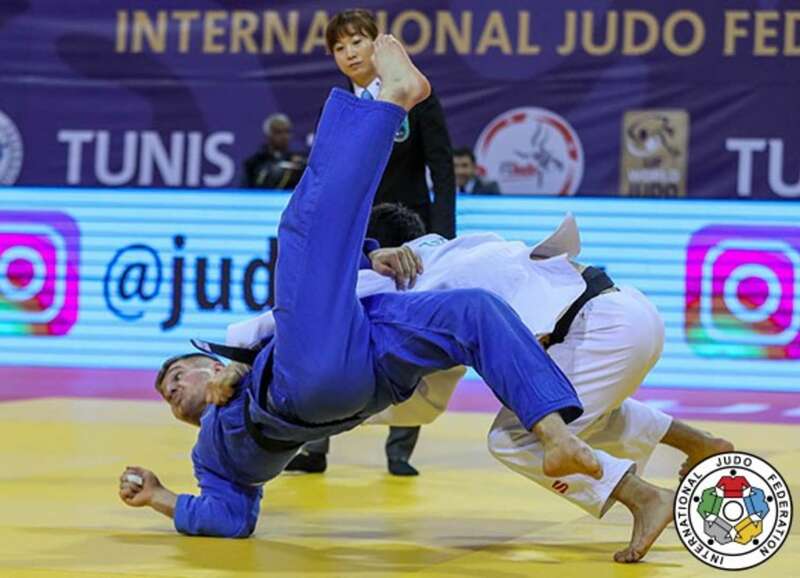 The first one to score in the final between Zhansay SMAGULOV (KAZ) and Akil GJAKOVA (KOS) was the Kazakh with an opportunistic kata-guruma that was followed a little bit later by an other beautiful movement, o-soto-otoshi, for a clear ippon this time. But what a day for Kosovo and Akil Gjakova. In his 13th Grand Prix, and after a lot of near misses, he has become Kosovo's first male IJF medallist at #JudoTunis2018 This silver medal for Akil, who made his Grand Prix debut in 2014 adds to his sister Nora's gold medal won yesterday in the -57kg. The first bronze medal match saw Benjamin AXUS (FRA) and FARMONOV Mirzokhid (UZB) competing for a place on the podium. One minute and 20 seconds were necessary to FARMONOV to score ippon with a beautiful piece of ko-soto-gari, which gave no chance to the French to escape. With a nice fairplay gesture, FARMONOV helped AXUS to stand up. 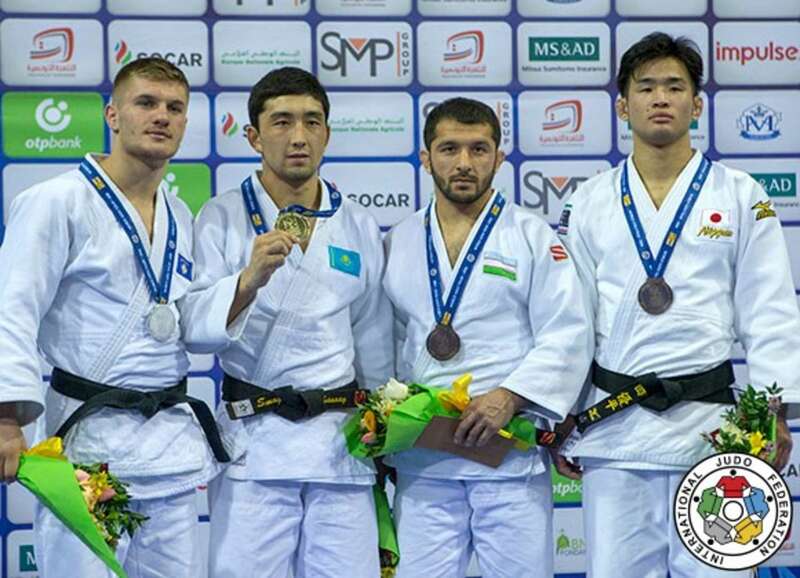 YOSHIDA Yuhei (JPN) and MOHAMMADI Mohammad (IRI) were opposed in the second bronze medal contest. After 1 minute 23 seconds MOHAMMADI received the first shido for passivity as YOSHIDA in pure Japanese style was the most active. The latter was also penalized with a shido for false attack just before the gong. As nothing else was written on the scoreboard, the two judoka entered the golden score and after 49 seconds were both penalized for passivity. It ws after 3 minutes and 33 seconds that YOSHIDA finally found a tiny opening inside MOHAMMADI's strong defense and scored a waza-ari with a drop seoi-nage. Former world number one, Kim POLLING (NED) was the favorite of the day in the -70kg and with no surprise she entered the final to be opposed to Roxane TAEYMANS (BEL). The Dutch champion was the first in action as she countered TAEYMANS attack with tani-otoshi for waza-ari. With a left-handed drop-seoi-nage that seemed to come from far away, Polling surprised the Belgian for the second time in a row and threw her for a second waza-ari which was synonymous of victory. 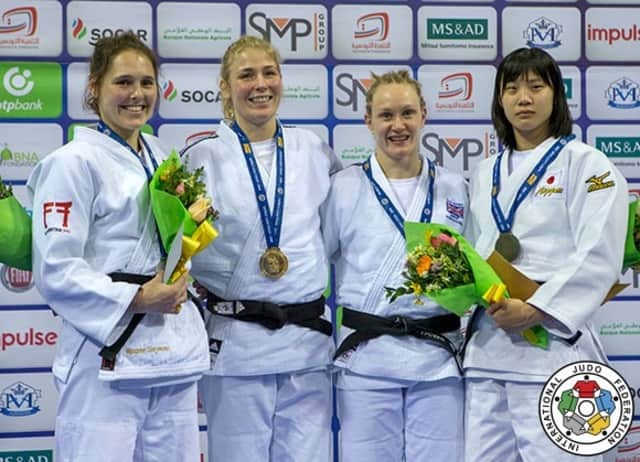 In the first bronze medal contest of the category, Gemma HOWELL (GBR) faced Michaela POLLERES (AUT). The latter was quickly penalized with a first shido. The first waza-ari came with less than one minute left on the scoreboard and was produced by the Briton with a ko-uchi-gari, enough to win the bronze in Tunisia. In the second bronze medal match Hilde JAGER (NED) lost out to Saki NIIZOE Saki (JPN) for a place on the podium. Less than a minute was necessary for the Japanese to install the grip, bring her opponent on the side of the mat area and make here react to launch a beautiful left-handed uchi-mata for ippon. For the very last final of the day, Vedat ALBAYRAK (TUR) faced Stanislav SEMENOV (RUS). SEMENOV was penalized a first time for escaping from the grip of his opponent. It was the turn of the Turkish athlete to be penalized for holding the judogi on the same side. Suddenly, SEMENOV took a strong lead as he beautifully countered ALBAYRAK's sase-tsuri-komi-ashi with a sumi-otoshi technique for waza-ari. Less than 20 seconds to the end, the Russian concluded with a nice combination from tachi-waza to ne-waza to immobilize ALBAYRAK for ippon. 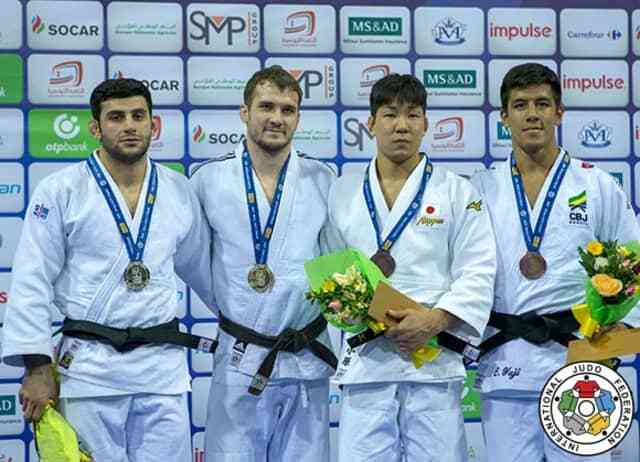 Dominik DRUZETA (CRO), bronze medallist at the European Championships last year and KOHARA Kenya (JPN), Baku Grand Slam 2017 bronze medallist, were opposed for a place on the podium of the first event of the year. After less than 30 seconds DRUZETA was penalised with a first shido and less than 10 seconds later was thrown by KOHARA with a tremendous o-soto-gari for ippon. It is the first medal at a Grand Prix for KOHARA. The last bronze medal contest of the day opposed Eduardo Yudy SANTOS (BRA) and the second Japanese of the category YAMAMOTO Yuji (JPN). Within a few seconds, SANTOS surprised YAMAMOTO of Tenri University with a ken ken o-uchi-gari for a ippon that was transformed into a waza-ari. As the match went on, SANTOS was then penalized with the shido, but that was not enough to change the physiognomy of the final result and the Brazilian won the bronze, a first medal for him at that level of competition.